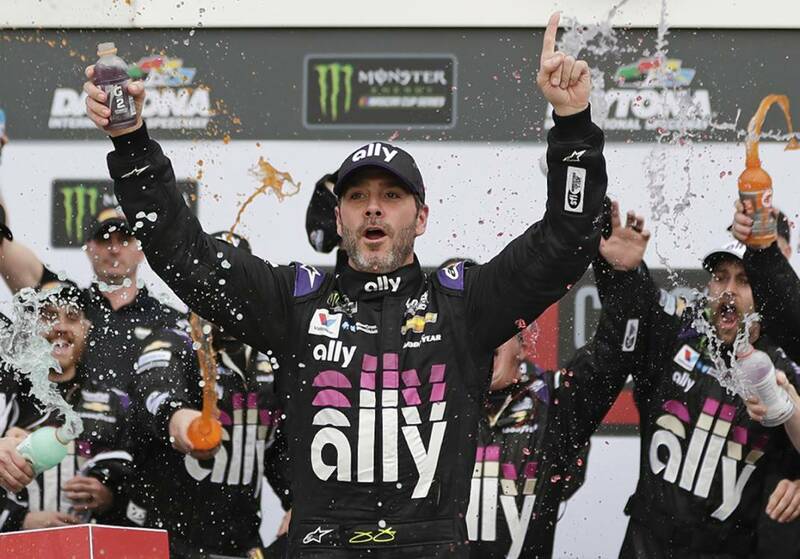 NASCAR Cup Series driver Jimmie Johnson celebrates in victory lane Sunday at Daytona International Speedway after winning the Advance Auto Parts Clash exhibition in Daytona Beach, Fla.
DAYTONA BEACH, Fla. — Jimmie Johnson's youngest daughter prays every night for Daddy to win a race. When Johnson scuffled through the worst season of his NASCAR Cup Series career, the seven-time championship driver felt the strain of not reaching victory lane. Johnson called his daughter's invocation "cute to hear." He didn't feel the same about critical comments saying he was past his prime. The 43-year-old Johnson tweeted "I'm far from done" in the offseason, and with a risky move in the rain Sunday at Daytona International Speedway, he showed there's plenty left in his ambition tank. Johnson triggered a wreck that wiped out nearly the entire 20-car field and zipped to the lead to win the rain-shortened Advance Auto Parts Clash, an all-star exhibition held in advance of next Sunday's season-opening Daytona 500. In 2018, Johnson went an entire Cup Series season without winning for the first time in his career, but a dose of aggression put him back in victory lane during the opening weekend of Speedweeks. Johnson's win capped a banner day for Hendrick Motorsports after two of Johnson's teammates, William Byron and Alex Bowman, locked in the front row for the Daytona 500 earlier during qualifying. Johnson's victory doesn't count in the official NASCAR record book, but it has to be encouraging as he begins a partnership with new crew chief Kevin Meendering and a new sponsorship with Ally. Paul Menard led 51 laps and controlled the race that was interrupted three times for rain. With more rain looming, Johnson dipped low and tried to side-draft Menard as they battled for the lead. But Johnson turned Menard and started a chain-reaction accident that left cars sideways and smoking behind the No. 48 Chevrolet. "I looked in the mirror, and there were a lot of cars caught up in it," Johnson said. The rain that ended the race hit not long after the decisive move. "I inherited a great core group of guys with the 48 team," Meendering said. "There's a strong foundation there, and the team really works well together, and it jells together. It's made that transition a lot easier." Johnson and longtime crew chief Chad Knaus were split up by Hendrick at the end of last season after winning those record-tying seven championships together. With Mendeering, he will pick up his quest to win a Cup Series race for the first time since June 4, 2017 at Dover International Speedway. Busch said team owner Chip Ganassi complained to NASCAR about Johnson driving below the double-yellow line to make the move, but Johnson was not penalized because the wreck forced him that low. "I felt like it was aggressive side-drafting," Menard said. "I got turned to the inside and hooked to the right, and all hell broke loose." Johnson had been caught up in many crashes in the Clash, failing to finish on the lead lap in each of the seven exhibition races. He was down at least 25 laps in five straight Clashes, and he understands just how quickly a race at Daytona can change. "I have a split-second decision to try to win a race, and I set up the pass and got position on him clean, "Johnson said. " I don't know what triggered his car wobbling, and then the accident started from there."